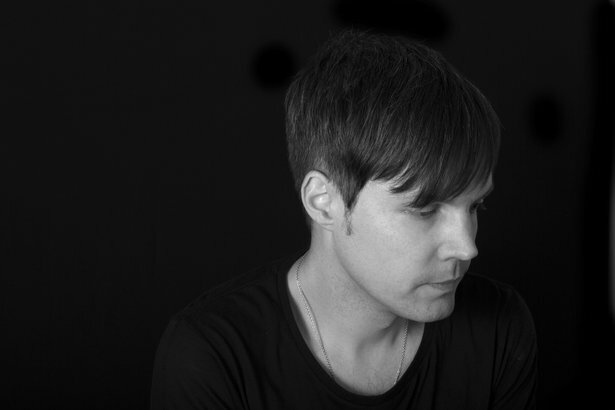 With halmark releases including the mischievious "R U OK" and last year's immersive mix, _ground , Ambivalent aka Kevin McHugh is a top-tier name in the realms of minimal and techno music. Kevin is also a long-time Live user, having used it for studio productions, live performances, and even incorporated as part of his DJ sets. Coinciding with his latest release, the Blackfish EP on Octopus Recordings, Kevin has shared a free Live Set (note: requires Live 9 Suite to run) featuring the core sounds and sequences from new track "Hexen." We recently spoke to Kevin about designing the sounds for "Hexen", the difficulties of making minimal music, and the beauty of a perfect fifth. “Hexen” makes great use of a small number of parts – the restraint seems to be part of the thrill of the track. When do you know that a track has “enough” parts to it? Anyone who says that simplicity is easy isn’t doing it right. I certainly can’t claim that I have a handle on it; discipline is one of those things I struggle to maintain in my production. Sometimes an idea calls for some complexity, other times it’s really important to listen and ask, “does this extra bit add anything to the end result?” I try to ask it early in the process and hopefully get to a point where there’s a full idea with some room to wander. Then it’s a matter of taking the essential elements and working out their narratives in a good arrangement. I try really hard not to ask myself any questions about whether it’s good until I’ve reached a stopping point. I’d rather throw away 10 finished tracks that aren’t good than overanalyze one unfinished loop for weeks. For the “Hexen” arrangement, did you play the Clips and effects live, or edit them in by hand? How do you usually make your arrangements? The Live Pack uses the same system as the original session. I started with one idea played on a keyboard, just a simple pentatonic riff, and then added layers by adding other synths. Then I used the Ableton Chord midi tool to add perfect fifths and octaves to each synth to make some harmonic density but still keep it simple. It was really easy to mimic my original session in this live pack, because the same tool was at the root of it. There are three synths layered for the chords in “Hexen”. Can you talk about how you designed the sounds for each layers? I was basically trying to mimic some of the patches I used in the external synths that appear in the original track, which were layered as well. I find that the Ableton synths have the same power, and sometimes a lot more functionality than the older synths I originally used. I really feel like the differences between analog and digital gear are just matters of taste. It was actually quite a fun exercise to use one instrument to mimic another, and find how much they can overlap. The layers gave me a chance to keep the sharp attack-heavy sounds, as well as the envelopes and waveforms that I liked in my original patches. Some of it depends on how a particular patch will evolve, and that it may need some support from another voice in the arrangement. One of the instances of Operator was great, but it stays constant while the others change. The instance of Analog was there to support the harmonies, but not overpower anything. Once I had the patches set, I added a bit of coloring with the Dynamic Tube tool to mimic the sound that comes from some of my preamps and such. It’s surprising how well it can create that feeling. Chord progression in Ambivalent's "Hexen"
The chord complexities also ebb and flow in the track – can you talk about this? I’ve always felt the most important part of having an idea comes when you test how far you can stretch it. Techno is a pretty good place to take one phrase and milk it for everything you can get. So this track was really an attempt to take this phrase and create some drama and a bit of a story. Nothing new – lots of artists have done it better than me – but it didn’t feel like the kind of hook that should just stay in one zone. I wanted a rollercoaster, and one where you don’t really notice you’re being dragged upwards until you’re there. Then shoot back down to zero and start over. The hi-hat is synthesized with Analog. Do you synthesize drums like this often? What are some advantages of synthesizing the sound over sampling it? The original session was recorded with a Vermona DRM1, and I recorded live takes opening the decay and filter on the hi-hat voice. It’s just a lot of fun to grab a control and play along with the arrangement. So the Analog plug-in was a natural choice, because it has that really classic structure and sound – a noise filter and an envelope, with the Dynamic Tube again to emulate the signal chain I used in the original. I tried to approximate my live studio recordings with how the automation appears in the arrangement section of the Live Pack. The bass sits nicely in the track – it looks like there’s some EQ tricks at work there. Can you elaborate on this? Bass harmonics were really a struggle for me for a long time, even more so when adjusting them against the kick drum. So much of a track’s viability rests in that one area. Bass has to extend far enough into the harmonic range without overpowering the whole mix, but also leave space for the kick to push through. In this track I’m trying to pull the kick’s fundamental and second order harmonic frequencies out of the bass, as well as tame the bassline’s reach into the low-mids. This gives space for the sub-harmonics of the synth layers, but still leaves some space for the rolling, boomy stuff I like. It helps that the bass is following the same pitches as the lead, so I can just find the crossover point and set that on the low-pass filter on the bass, and the hi-pass and shelf for the leads. A bit of sidechaining gives extra breathing room for the kick, without getting too pumpy (okay a little pumpy). The Ableton compressor always does all of my sidechaining, whether it’s a digital or analog source. It’s just a really simple, functional, transparent tool. 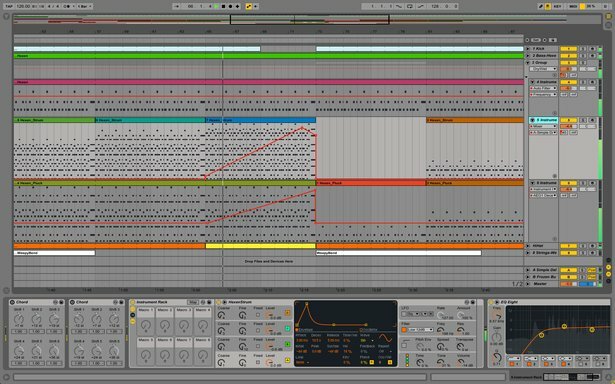 The sidechains in Ableton’s effects are incredibly fast and easy to setup, and the EQs in Live 9 have a ton of great new features like sharper curves for hi and low-pass, the spectrum view and the mid-side feature.